Periodontal (gum) disease affects millions of people all over the world. It is the number one cause of adult tooth loss, and has been linked to a host of other ailments like diabetes, heart disease and problems in pregnancy. Nearly half of adults age 30 and older have some degree of gum disease, and the percentage increases with age. However, because the symptoms can be very subtle, many don't realize they have gum disease until it starts to take a serious toll. Healthy gums are vital to a beautiful smile and to overall oral health — yet, when gums are not healthy, they not only look less appealing, but can also lose their tight attachment to the teeth. One of the chief signs of gum disease is the presence of periodontal ("peri" – around; "odont" – tooth) pockets — that is, spaces around the teeth, below the gum line, that have become infected. Pockets provide an ideal environment for bacteria to grow, and may spread infection to the structures that keep teeth anchored in the mouth. Although periodontal pockets are invisible to the eye, they can be detected during an oral exam, when the space between the gums and teeth is measured. During a comprehensive examination, your dentist or hygienist may probe your gums and read off numbers like "three-two-three…four-three-three…" These numbers indicate whether periodontal pockets are present, and how deep they are. Taken together, they can give your dentist an accurate picture of the health of your gums. Even in healthy gums, the top of the gum tissue does not attach directly to the tooth. Instead, there is a small space between the tooth and gum called a sulcus. Bacteria and food particles may collect in the sulcus, but for the most part they are removed by brushing and flossing. However, a toothbrush generally does not reach more than 2-3 millimeters (about one tenth of an inch) below the gum line. If the sulcus is deeper, bacteria and food debris can build up below the gums, causing inflammation and swelling. When gum tissue begins to separate or pull away from the teeth, it leaves a larger space between the tooth and gums where harmful bacteria can thrive. At this point the space is called a "pocket." Inflammation is present, and the once healthy sulcus has become deeper because it is diseased. If bacteria in the pocket remain undisturbed, they will continue to accumulate there, causing further loss of bone and gum tissue attachment beneath the gum line, and eventually eroding the structures that hold the teeth in place. The early stage of gum disease is called gingivitis, or "inflammation of the gums." Here, plaque builds up around the gum line, the gums become inflamed, and they may begin to swell. There is no bone loss with gingivitis — and fortunately, this common form of gum disease can almost always be reversed with good oral hygiene and regular professional cleanings. Left untreated, gingivitis can progress to a more serious stage of gum disease called periodontitis. Periodontitis causes damage to the tissues surrounding the teeth, including bone, periodontal ligaments and the gum tissues. While many think teeth are directly supported by bones in the jaw, the true anatomy is more complex. Teeth are actually held in place by thousands of tiny fibers that connect the root of the tooth to the bone. These fibers can be damaged or destroyed by bacterial infections that stem from untreated periodontal disease. 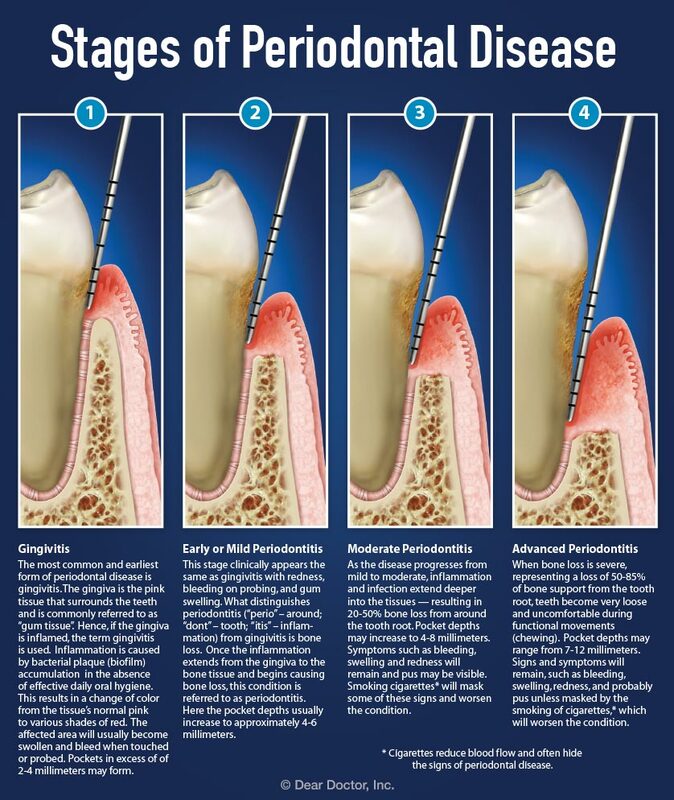 In a case of periodontitis, pockets allow infection to spread, resulting in bone loss underneath the gums. These are the kind of "deep pockets" that no one wants, so it's important to diagnose and treat them before they threaten the integrity of the structures that support the teeth — or even cause tooth loss. To monitor the health of your gums, your dentist uses a special tool called a periodontal probe, a small hand-held instrument that measures the gap where the tooth meets the gum. During the periodontal examination, the dentist gently inserts the probe between the tooth and gum, and then measures from the top of the gum to the bottom of the sulcus or pocket. Six measurements, in millimeters, are taken around each tooth: three on the outer (lip) side and three on the inner (tongue) side. These measurements are recorded, and can be used to track changes in your periodontal health over time. Measurements ranging from 1 mm to 3 mm generally indicate a normal, healthy attachment of the gum tissue around the tooth. A snug fit between tooth and gum (no more than 3 mm) makes it easier to remove plaque bacteria from beneath the gum line, where it can affect the attachment of gum tissue to the tooth. 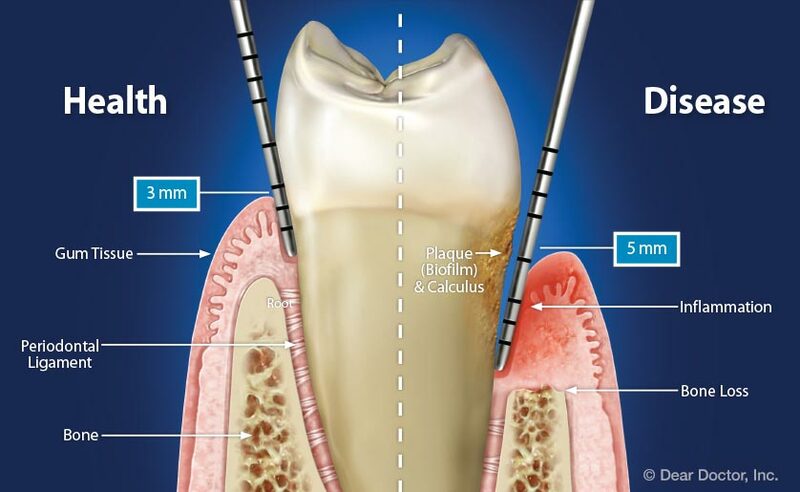 Any space over 3 mm deep may signify gum disease, particularly if gums bleed. Larger numbers (usually ranging from 5 to 12 mm) reveal the presence of periodontal pockets, which make it more difficult for an individual to control plaque effectively with at-home oral hygiene. In most cases, the larger the number, the more bone loss is present, and the more difficult it is to keep teeth and gums healthy. A 4 mm measurement is often the dividing line between a normal sulcus and a periodontal pocket. However, while pocket depth is significant, other factors must be taken into consideration when diagnosing gum disease. For example, even mild gum disease (gingivitis), where inflammation has not spread beyond the gum tissue, may lead to a higher reading. This can occur when inflammation causes the gums to become swollen, which in turn causes the dimension between the bottom of the sulcus and the top of the gum tissue to increase. In the presence of other signs such as bleeding gums, a measurement of 4 mm could very well indicate a periodontal pocket. In the presence of other signs such as bleeding gums, a measurement of 4 mm could very well indicate a periodontal pocket. However, your dentist may consider a healthy 4 mm space to be a sulcus, as long no bleeding is present. On the other hand, even a normal measurement, such as a 3 mm space, could be considered a pocket if inflammation, bleeding and tartar are present. Since every periodontal pocket is different, specific treatment recommendations will depend on the depth and shape of the pocket, and whether the inflammation is restricted to the gum tissue, or if it has spread to the bone that lies beneath. Your dentist may wish to take x-rays to determine if there is bone loss from around the teeth, and to what degree. Getting rid of plaque bacteria (also called biofilm) and tartar is the first step in keeping gum disease from getting worse. In the case of inflamed gums with no bone loss, even a pocket depth of 4 mm or 5 mm may be treated with professional cleanings to remove the causes of the inflammation, along with an enhanced at-home oral care regimen. This will likely include, at minimum: brushing your teeth twice a day with a soft toothbrush and fluoride toothpaste; flossing daily to remove plaque between the teeth where your brush can't reach; and using an oral rinse if recommended by your dentist. 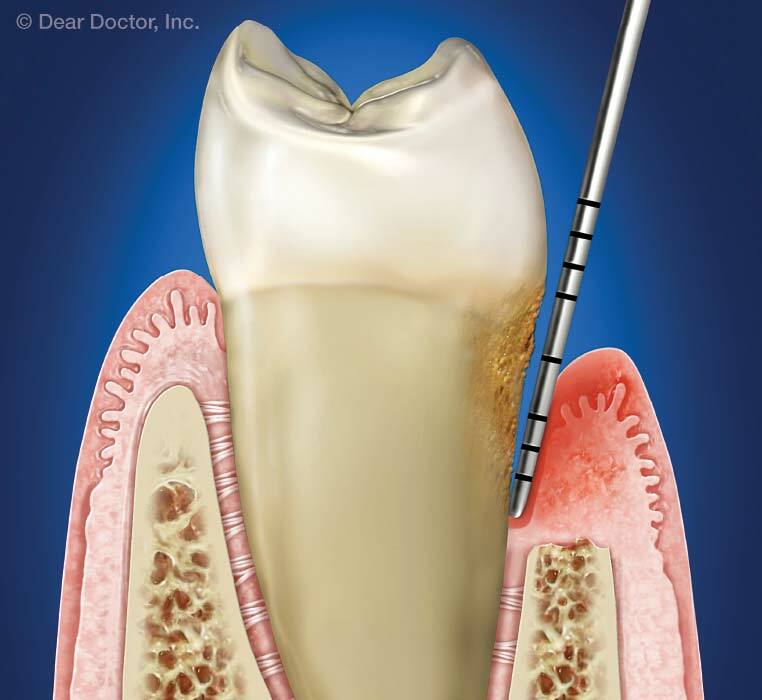 If more severe periodontal disease is present, a procedure called scaling and root planing may be recommended. This thorough cleaning procedure not only removes the plaque and tartar, but also smooths the root surface so the gum tissue can reattach to the tooth, shrinking the pocket. Sometimes, antibiotics may be used to reduce inflammation and help control bacteria underneath the gum line. Antibiotics can be given in pill form, but most often are directly applied inside the periodontal pocket. If a pocket is too deep to be treated with non-surgical procedures, surgery may be recommended to reduce the size of the pocket. This procedure is often done by a periodontist — a dentist who specializes in the treatment of the gums and other supporting structures of the teeth — and may be performed with standard surgical tools or with laser instruments. Although gum disease is one of the most common health problems throughout the world, it's largely preventable with good oral hygiene: That means brushing twice a day for two minutes each time, and flossing once a day, every day. And fortunately, in many cases, gum disease can be reversed if caught early. But left unchecked, periodontal disease can lead to tooth loss and other negative health outcomes. 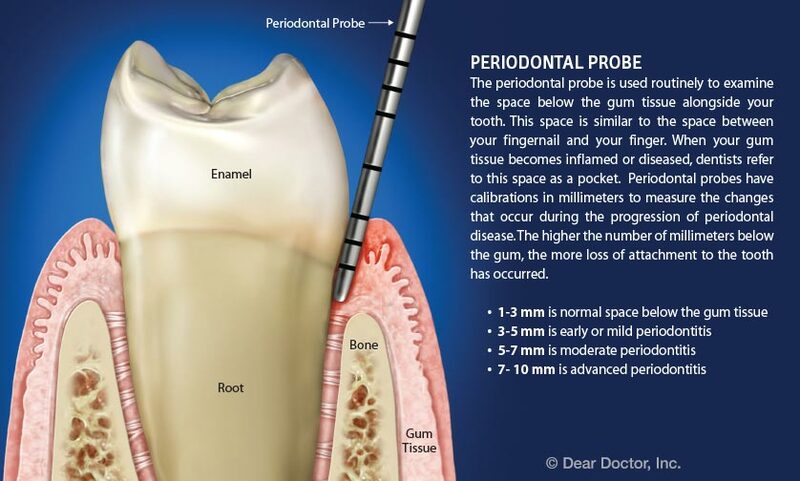 Periodontal pockets are one of the major signs of gum disease. Even though you can't see them, your dentist can detect them during a regular exam, and offer treatment before the pockets progress any further. You can play a key role in your own oral health by scheduling regular dental visits and cleanings, quitting bad habits like smoking or drinking sugary sodas, and practicing good oral hygiene at home. Keeping your teeth and gums healthy is the best way to ensure you'll have a bright smile for years to come. If you have questions about how to keep up your oral hygiene, ask your dentist for advice.